Want to See this artwork on your wall? Click here to use our interior design service. Fast and 100% Free! 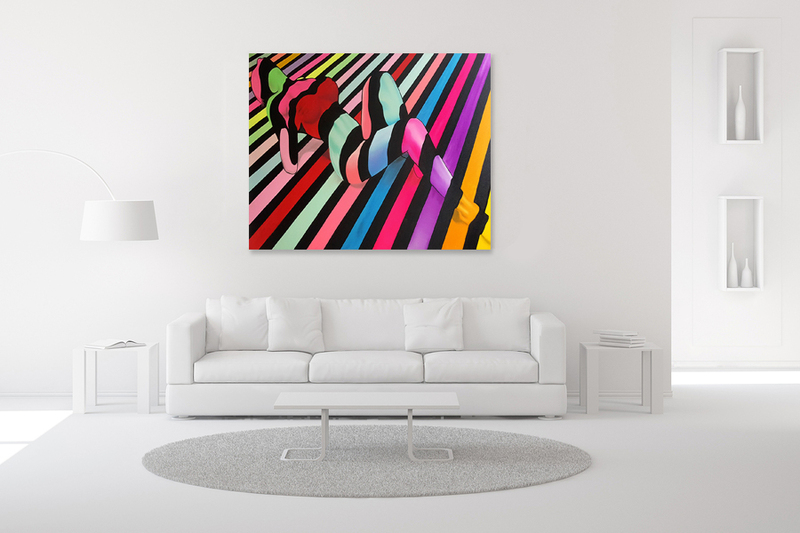 Buy a cheap canvas wall art from our wide selection of hand painted abstract wall paintings on our huge gallery. 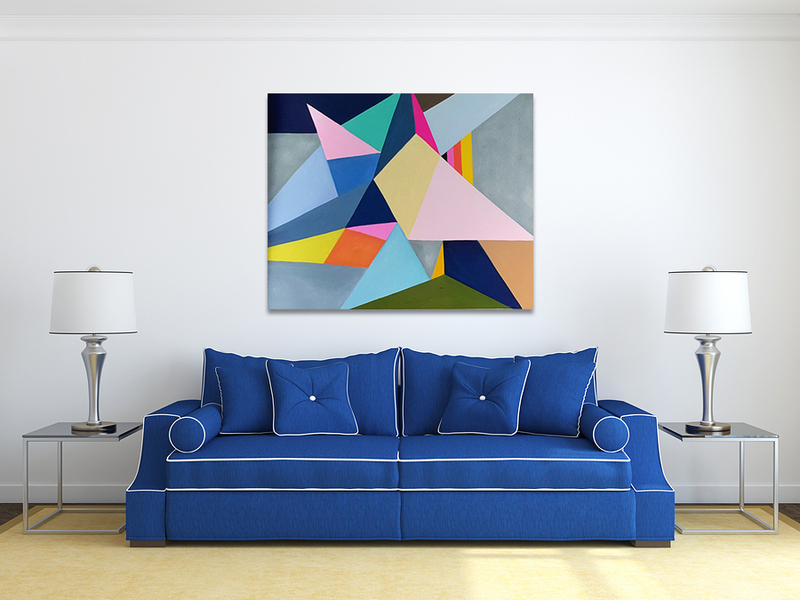 Aquamarine is a wall painting that depicts the colors of aquamarine in abstract form. This cheap canvas art is ideal for your home or office space. 100% Hand Painted Oil Paintings on Canvas! Call us on 1300 90 21 53 and talk to your friendly art customer service representative. Australia's number one Oil Painting supplier with 10+ years of delivering masterpieces Australia wide. Framing Options: All 2016 New Art paintings come stretched and Ready to hang. 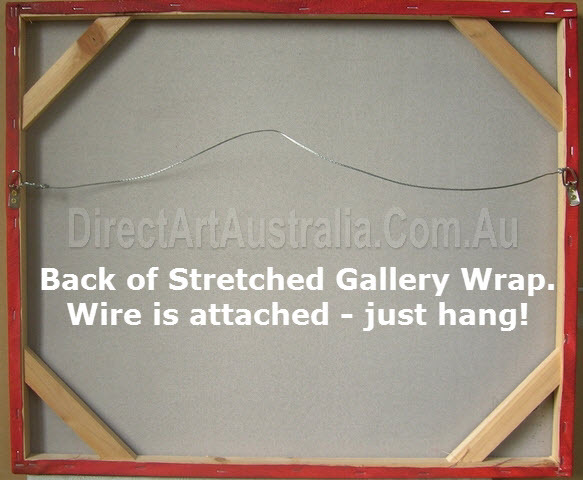 The back of the Stretched Gallery Wrap looks like the image below - it has a hanging wire! Direct Art is committed to make our customers are 100% satisfied with their purchase. Therefore, If you are not completely satisfied with your purchase (because of quality issues or damage) you may return your purchase to us within 30 days of receipt and receive the refund of your purchase price minus shipping and handling costs, or you may have choice of free replacement after return your purchase. Please contact us by e-mail for return instructions and a Return Authorization (R.A.) number. A Return Authorization (R.A.) number must be obtained from Direct Art in the event that items are to be returned . Before initiating a return service, we suggest the customer prepare the invoice number and product name in order to reduce the process time; Customer will be required to provide proof of purchase. We will require the Customer to show the R.A. number prominently on the outside of the package to reduce the return process time. All items must be returned to Direct Art within 7 days from the release of the R.A. number. All returned items must be in brand-new condition, unused and with the original packaging. Requests to return items due to quality issues, damage during shipping, color/style/size error from use must be accompanied by photos or other evidence that clearly shows the problem with the item received. Paintings with quality issues eg more than a 20% variation (see variation paragraph below) are eligible for a full refund minus shipping costs within 30 days of receiving your order. Damaged paintings are extremely rare. Please do not accept packages if they are damaged, creased or torn. 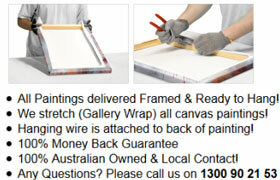 Direct Art will not refund paintings if customer accepts a damaged box from the courier or Australia post. We do not offer refund on items that have been wrongly selected or change of mind. Please note All artworks from Direct Art are 100% hand-painted, and there maybe 5%-20% slight variations. This is accepted by the customers when placing an order, and returns will not be accepted due to slight variation. Variation can occur due to differences in computer monitor colours and/or the nature of the medium eg hand painted are painted by real artists and not exact copies eg a print. - Any order is cancelled within 24 hours of payment confirmation will be eligible for a fully refund. It is a 100% money back guarantee. - The Orders cancelled more than 24 hours but within 72 hours after payment confirmation will be eligible for a partial refund consisting of the full shipping cost and 50% of the product purchase price (if the item has not been shipped). - Orders cancelled more than 72 hours after payment confirmation (and before the item has been shipped) will be eligible for a refund of the shipping costs if apply. - Once your order has been shipped, it can no longer be cancelled. Portraits & custom art (plus any modified artwork) require a 30% non-refundable deposit before we start. Direct Art Pty Ltd. - trading as Direct Art Australia ABN Number 14613229342.